There are a lot of different things that will improve the accuracy of your handloads. Using "exactly" the right amount of powder is one of the more important things. Before I decide how much powder to use, I always compare two or more reloading manuals. I first select what "appears" to be the best powder for the bullet I'm shooting. You'll see what is considered to be a safe maximum load listed for the particular rifle being tested. 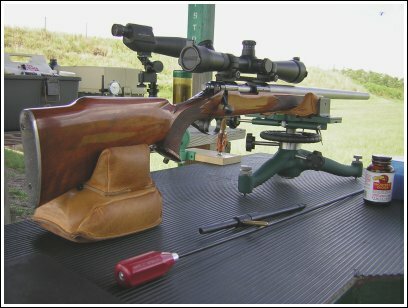 Keep in mind that each barrel is unique, and it will develop a different amount of chamber pressure compared to other rifles. I begin by taking my reloading equipment to the range, and I use a chronograph to measure the exact velocity of my handloads. The first thing I do is assemble and fire a single round that is well below the maximum published load. I examine the fired case for pressure signs, then I usually test rounds that are slightly hotter. Each round is usually loaded with an extra .3 to .5 grain more powder. After each firing, I'll examine the primer for signs of excessive pressure. When the edge of the primers become completely flat, it's time to stop increasing the powder charge, because that indicates the maximum safe load. At this point, I shoot the first (5) shot group with my maximum load. I then make 5 more rounds, and reduce the powder by .3 grains, and shoot another 5 shot group. I repeat this process a few times while comparing the accuracy of several lighter loads. Somewhere in this process, I'll find the velocity range that delivers the best accuracy with my particular rifle and bullet combination. This method works very well for me. Don't jump to conclusions after shooting one great group. Back it up by firing at least two more groups. It's pretty rare for a shooter to just take a wild guess at how much powder to use, and discover great handloads that shoot well in all rifles. When you're sure that you've found the most accurate load, be sure to record that velocity. When a good friend of mine Dwight Hall, is asked for accuracy tips, he'll always reply "Velocity, Velocity, Velocity . . . . you've got to find the EXACT speed that shoots best with your particular bullet - in your particular rifle." Developing handloads with a chronograph is a definite advantage. With this method you can test any other type of powder by duplicating this same velocity. You'll almost always shoot the tightest groups at (or very near) this speed. After you decide on the best powder, you'll need to experiment with bullet seating depth to see which setting delivers the best accuracy. Here are a few other thoughts on the subject. A chronograph will show how little velocity is affected by a slight variation in powder charge. After you've decided on an accurate load, there's rarely a need to weigh individual powder charges. 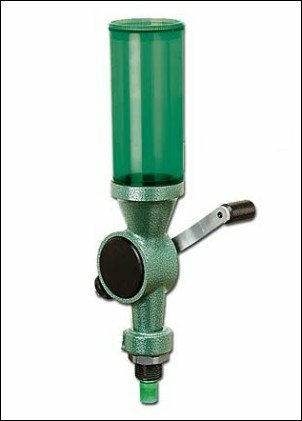 A good quality powder measure can drop consistent powder charges with most types of powder. I reload for about a dozen different calibers, and I've only found one caliber that requires powder charges to be individually weighed for each and every round. That caliber is the 300 Whisper. Mine needs to have an extremely uniform velocity, because even the slightest variation in velocity will have a major effect on its trajectory. This is because my 300 Whisper shoots a subsonic 220 grain bullet, and it has a scope that uses several 50 yard markings on the reticle. Back when I was shooting in snow country, I once discovered a surprising amount of unburned powder lying on the snow, in front of where I was shooting. This shows that it's possible to burn too little of a slow burning powder, before you run out of barrel length. It's also important to use magnum primers with the cases that have a huge capacity. Speaking about primers . . . . if your primer pockets loosen up, it almost always indicates that you're handloads are generating too much chamber pressure. Try using a different powder or just back your load down a bit.